Me and my friend are at a café and like always our conversation drifts into the seemingly inevitable: the construction sites, which rumors we’ve encountered and the questions of whether (our) culture and place in this city are on a path towards evanescence. For me, this sentiment is characterising Umeå in 2014 – European Capital of Culture, but above that, in a moment of transition. We are both born and raised, and though some years in-between and on different sides of town, we share a common experience. In many ways it’s pretty typical for growing up in a smaller Swedish town in those days. The weekdays of our teens mostly consisted of purposeless walking the city streets, hanging around the concrete stairs at the main square, panhandling for cigarettes outside the regional fast food chain and picking fights with kids who happened to embrace another subcultural identity, though none of us really understood the reasons for our antagonism. In the weekends we usually went to the municipal youth center from which we where thrown out, giving us the feeling that drinking ourselves hammered in some open stairwell or another non-place really was the only possible thing to do. The meaning of»fun« was to find something to wreck, but that would often end us up crying in the backseat of a social service or cop car. But we did dream about something. Creating places for kids like us. When it was my turn to go trough this experience, some years had passed since Umeå municipality closed what had probably been one of the most well attended and beloved youth centre’s in Sweden. Intentionally eradicating an emergent youth movement which sense of community was based on strong commitments against everything that one might call »drugs«. Though the official explanations referred to the need for budget cuts, another story has rumoured the city’s underground ever since. A tale about fear among politicians and public officials for a growing movement which most radical participants committed arsons at slaughter factories and released thousands of mink from close-by fur farms. The unwillingness to really understand what was going on would result in the lost trust of a generation, maybe two. When I encountered the remains of that cultural milieu in my mid-teens, one the first lesson learned was to see the state as enemy – as a hazard to living grassroots culture. The struggle for self-governed, purpose-suited spaces was ever present and for me first hand experience of the atmosphere when attempts were made to negotiate with municipal actors came about quite quickly. There’s a meticulous difference between boredom and the kind of hopelessness one gets after making effort to do something good getting the reaction that it’s unwanted. Sometimes 2004, during the middle of winter, an old wooden house was squatted near the city centre. My friends and me went there the first night to spend some freezing cold hours with roughly 100 other kids, watching different bands. I went back every day, tried to help out with this or that, until the day the cops evicted were after the house was demolished. There was again some kind of campaign for a self-governed youth centre, but the politicians didn’t listen that time either. 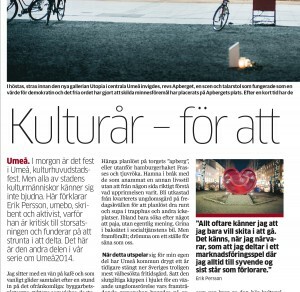 Some years had passed since those cold weeks when I read in the local daily that Umeå had applied to become European Capital of Culture (ECoC) for the year 2014. We had then recently rented an old textile warehouse located at a back alley in the city centre to open a small music venue with practice rooms, a café and a space to host gigs. We had done it by ourselves, leaving years of meaningless bargains and campaigns leading nowhere behind us. When journalists asked local politicians why Umeå should get the ECoC-title, they said that this city for decades had supported its cultural actors. Here, they explained, there are institutions like the opera and the museum, but as well exciting and dynamic grassroots culture. I’m trying to re-visit my thoughts and the discussions we had at that moment, when all of it was presented. Partially anger and suspicion because of the sudden accredited value, but also partially feelings of hope to finally be recognised and maybe have the chance to get a more given place in the city scape. We are now seven years passed. Only the anger remains. Sure. There are plenty of cultural associations who have gotten their share of the treasure to create something out of the ordinary and to grant diversity to the programme. But there are larger, radical implications of the ECoC on Umeå as a city. It became the starting point for a shift of economical paradigm, materialised in a massive re-development of the urban environment. The small music venue we opened in 2007 has been evicted as the property owner went forward with a plan to build a skyscraper. It is now re-located to the outskirts of town. The whole area were it was located, then back alleys, is now being gentrified around the main project of building a semi-commercial culture house with an integrated hotel. A well-attended and for many small associations existence decisive theatre space is meanwhile being forced to move as another developer want it gone for another high-rise estate project. There is a similar story to be told about the destiny of the city library. The real winners in this tale are the property owners whose real power has grown extensively during the last couple years. With that insight faded the smiles we might have shared over recognition before they ever stuck. Now we are left with a city were culture primarily is viewed as a means to attract new inhabitants, tourists and investors to keep the treadmill of growth running. In this city are critical protests mounting around issues of bursting democratic processes and the continuous withering of spaces deemed important by many citizens. From the various communication outlets of Umeå’s municipality come rapid streams of advertisements for gigs, theatre shows, dance performances and other culture events. Each day I have the same impulse to stay away – even from spheres I’ve granted most of my life for. If I do attend, I end up with the feeling of being a walker on in some kind of marketing scheme which success inherently means that I loose something important. Playing along ends with me standing outside a construction site fence, seeing something I love being demolished to leave space for yet another hotel for the visitors to the European Capital of Culture. This essay was originally published 2014-01-30 in Swedish by southern Swedish local daily paper Kristianstadsbladet. The inauguration of Umeå as the European Capital of Culture took place the same weekend.